According to the abstract of title, it appears that this house was built during 1889-1890, after which all the mechanic's liens on the property were paid off, probably when it was sold on 14 May 1890. The first owners, Louisa and Charles Richardson, took out a mortgage on that date for $3,000. In the first 13 years of its existence the house was sold to 5 owners, probably for financial speculation and because of problems associated with the financial panic of 1892. The house was bought by Alva Harry Kirk 18 December 1903 for $3,000. Mr. Kirk was a miller in Fergus Falls, Minnesota and moved his family to Minneapolis after his mill burned. Mr. Kirk invented an automatic grain tempering machine that added moisture to grain before it was milled. The moisture prevented both excessive dust during milling, which is an explosion hazard and a product loss. He built these machines in a shop behind the house, which was converted to the present garage in the early 1970s. Alva and his wife, Regina died in 1928, after which the house passed to his unwed daughters, Katherine and Zoe and son Donald. Donald relinquished interest in the house to his sisters immediately. The women lived in the house until Zoe died in 1948 and Katherine was pronounced incompetent on 25 June 1963. The house was transferred to Hennepin County in payment for property taxes in arrears and to pay for Katherine's guardianship. The house was sold to Kermit Knutson in 1966, who sold it to Robert and Nancy Hanlin in 1968. 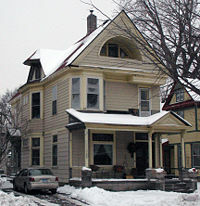 The Hanlins raised their family in the house and sold it to the current owners, in 1994. This page was last modified on April 6, 2019, at 18:38. This page has been accessed 14,269 times.